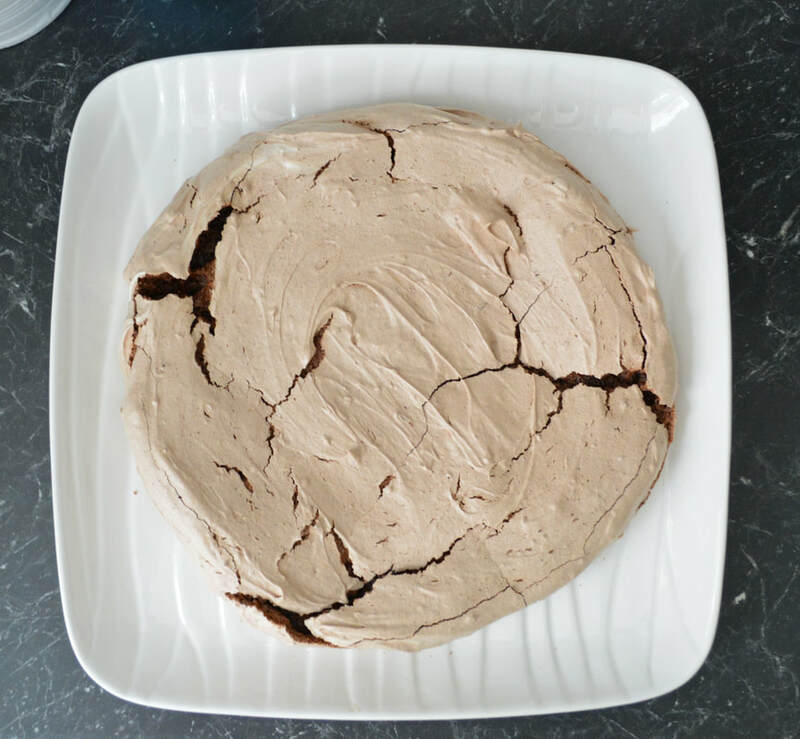 Anyone that has not tried a chocolate pavlova needs to. This recipe doesn't use a lot of chocolate, yet in the end, the flavour of the chocolate shines through. It is delicious. It is light. It is amazing. I had family over yesterday so I decided to try this out on them, it was gone in minutes, even the baking paper was being scraped off of any leftover chocolate goodness. 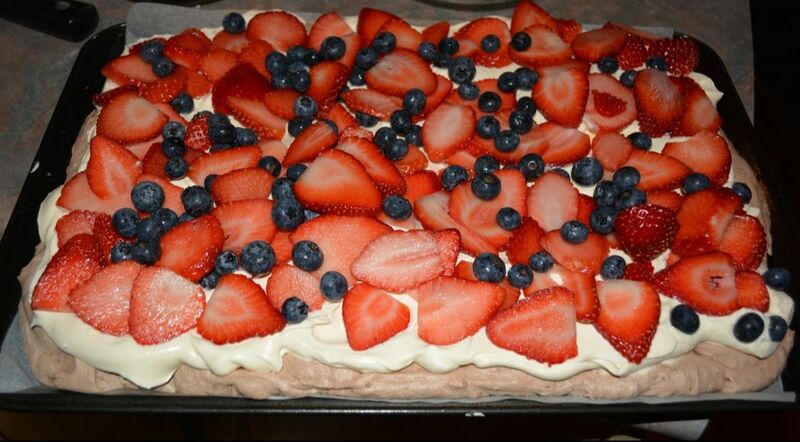 The original recipe is for a 23cm round pavlova, and I have made it a few times now. It tastes amazing, but what I find is that the middle collapses, every time. Now it doesn't really matter as I fill in the caved in bit with the cream and berries, and no one knows, and it does still taste amazing. So don't deter this from you making it, as it truly is delicious. I thought I'd try a large rectangular one also, this one did not collapse. It was perfect. I will give cooking instructions for both methods. 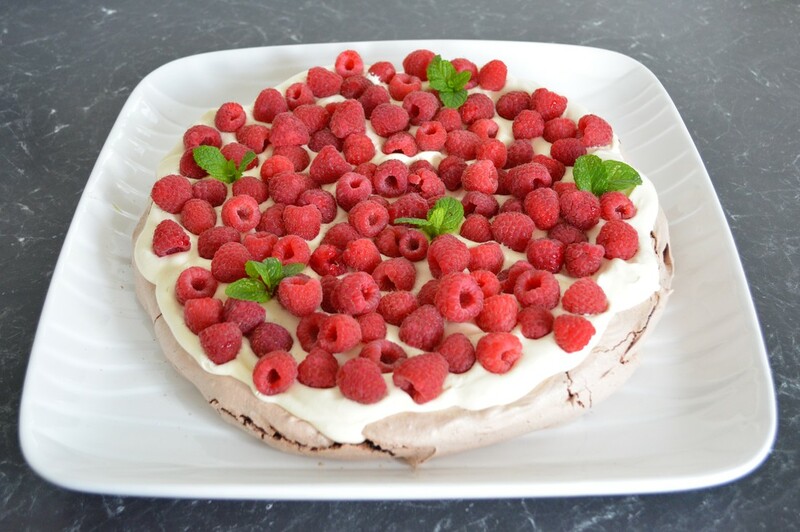 I like strawberries and blueberries, but raspberries alone look amazing and taste delicious with this pavlova. Grease a 38 x 25cm baking tray and line with baking paper. Beat the egg whites in an electric mixer until soft peaks appear. Then adding a spoonful at a time, add the sugar in slowly until it all incorporated. Keep beating until you have stiff, glossy peaks. Carefully fold in the cocoa, vinegar and chocolate, until the cocoa is thoroughly mixed in, just be careful not to knock the air out of the mixture. Make a mound in the centre of your baking sheet, approximately 23cm in diameter, smoothing the sides and top. Place in the oven, then immediately turn the oven temperature down to 150C/130C fan forced and bake for 1 to 1 1/4 hours. It is ready when it looks crisp around the edges and sides and be dry on top. But if you press on it gently it should be bouncy beneath the crust. Turn off the oven and open the door slightly, allow to cool in the oven for 2 hours. When ready to serve, place on a serving plate, or leave on the baking tray. ​Beat the thickened cream until it is thick but still soft, pile it on top of the meringue. Scatter over the berries of your choice. For the grated chocolate, try and make curls, if you can't do it just coarsely grate it and sprinkle over the top. Spread the mixture gently onto the baking sheet, leave a 2cm border around the edge. Place in the oven and bake for 30 minutes. Then turn down the oven temperature to 140C/120C fan forced and bake a further 40 minutes. Turn off the oven and open the door slightly, allow to cool in the oven for 2 hours. When ready to serve, place on a serving plate, or leave them on the baking tray (rectangular one especially). Beat the thickened cream until it is thick but still soft, pile it on top of the meringue.